In the summer of 2016, Positivus Festival will celebrate its 10 year anniversary by offering its most vibrant and music-packed programme yet, with the first headlining female artist to be announced on November 30th. Ticket prices are set to increase from December 3rd, with a gradual rise up until the festival week, when Salacgriva’s fisherman’s park will transform into Baltic's three-day musical capital. “Our anniversary festival budget will be at least twice as substantial compared to this year, so that our visitors will truly be able to witness some of their favourite contemporary artists. So it's wise to buy tickets in advance while they’re still in last year’s price range, for the ticket prices will only keep rising,” informs Positivus Festival’s organiser Ģirts Majors. Currently Positivus Festival tickets are available for last year’s prices - a three day ticket costs 65 € and a three day ticket with camping - 73 €. A camping site ticket can also be purchased separately for 10 € - this price will not be subject to change up until the festival. Ticket prices are set to rise from December 3rd onwards - a three day ticket will cost 79 € and a three day ticket with camping - 87 €. VIP tickets - priced 250 € will also go on sale on December 3rd. VIP ticket holders will have exclusive access to many special festival features, including limited performance vantage platform entry, an off-limits recreational area with a bar and a restaurant, as well as other benefits. The next ticket price escalation is expected on April 4th, along with the release of one day tickets, priced 50 €. Starting from April 4th, a three day ticket will cost 90 € and a three day ticket with camping - 98 €, with VIP and camping site ticket prices remaining unchanged. During the festival week - from July 11th onwards, ticket prices will rise again. A three day ticket will cost 100 €, a three day ticket with camping - 108 € and a VIP ticket will be available for 300 €. 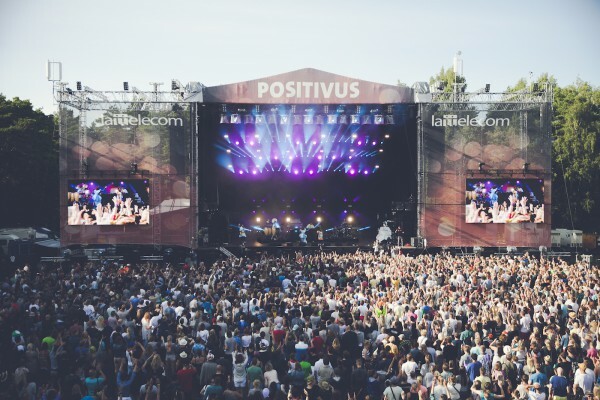 Positivus Festival is Baltic’s biggest music and arts event, gathering more than 30 thousand visitors for the past two years and boasting an intriguing coastal forest ambiance that the festival’s renowned for. Over the years, the Positivus Festival has hosted a multitude of brilliant performers, including Robert Plant, Muse, Kraftwerk, Sigur Rós, Ellie Goulding, Manic Street Preachers, James, Moby, Sinéad O’Connor, Prāta Vētra and many other formidable global and local acts. The special atmosphere is also created by numerous arts and culture events - movie shows, various performances, theatre plays, as well as a designated children’s recreational area for the youngest festival guests. The 2016 Positivus Festival will be taking place from July 15th - 17th. Positivus Festival’s main partner Lattelecom - Latvia’s leading technology enterprise, not only provides essential technological solutions, but also prolongs the festival with the special Positivus Festival TV channel.